St. Patrick’s Day, the feast day for Ireland’s patron saint, has come to embrace all ethnicities, not just the Irish. Some of the most popular traditions, now celebrated in countries around the world, got their start in the United States. New York’s parade, held each year, is the world’s largest and longest, with 200,000 participants and nearly 3 million spectators. It traces its roots to March 17, 1762, when a small group of Irish New Yorkers marched to John Marshall’s inn. 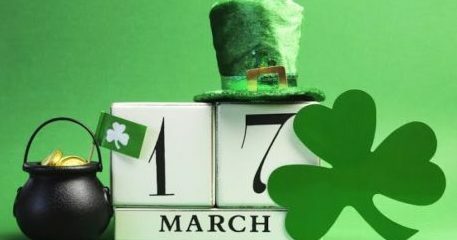 The earliest recorded St. Patrick’s Day observance took place in 1737 in Boston. Other famous St. Patrick’s Day “traditions” are actually a novelty to many living in Ireland, where until a generation ago the holiday was celebrated strictly as a religious feast day. Where did people get the idea to wear green clothes or add green dye to rivers and fountains? Or eat corned beef and cabbage? Again, look to the United States. Twenty-two U.S. presidents have Irish roots. Andrew Jackson is the only president whose parents were both born in Ireland. Nine signatories of the 1776 Declaration of Independence were either Irish immigrants or descended from Irish immigrants. More than 20 of George Washington’s Revolutionary War generals and the first man to hold a commission in the U.S. Navy were Irish also. More than 190,000 Irish-born Americans fought in the 1861–1865 Civil War. The Congressional Medal of Honor, the highest U.S. military honor, has been awarded to 253 Irish-born men. That’s more than the number of awardees born in any other nation, except the United States. More than 34 million Americans claim Irish ancestry. That’s seven times the population of Ireland itself. There are 16 places in the United States named Dublin, after Ireland’s capital. In the U.S., St. Patrick’s Day has become an opportunity for everyone — Irish or not — to celebrate and offer their own interpretation of “Irishness.” As the saying goes, everyone is Irish on St. Patrick’s Day.